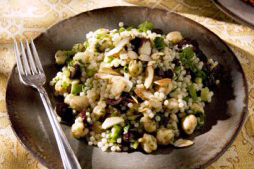 This elegant herbed couscous is a lemon-lover’s delight. We like it best made with all of the herbs. The flavor develops beautifully overnight in the refrigerator. This is excellent served with Citrus Marinated Feta. Put the couscous and salt in a bowl and pour the boiling water over it. Cover and set aside for about 10 minutes, until the water is absorbed. Fluff the couscous with a fork, separating any lumps. Add the chickpeas, olives, the lemon and oil mixture, and the herbs and toss well. Instead of fresh mint, add about a tablespoon of herbal spearmint or peppermint tea (1 teabag) when you add the water to the dry couscous. Reprinted with permission of the authors, the Moosewood Collective, from Moosewood Restaurant Simple Suppers, Copyright 2005 by Moosewood, Inc., Clarkson Potter, publishers, NY.